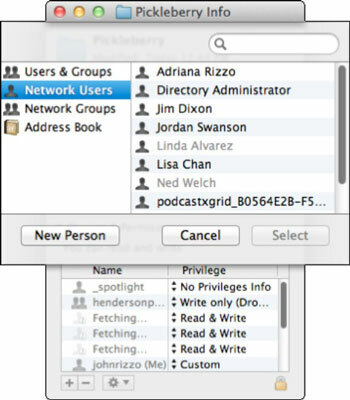 You can also change a share point’s user and group permissions in Lion Server from the Finder by using the Get Info window of the shared folder. Here, you can add and delete users and set basic POSIX permissions. This method isn’t as convenient as using the File Sharing pane of the Server app, particularly if you’re configuring multiple folders. You’ll have to dig through Finder windows to configure each one. But it does expose some options that more experienced administrators may find useful. 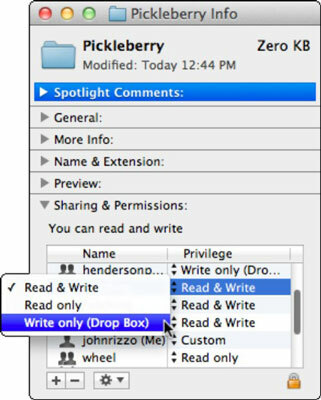 1In the Finder, select a shared folder and press cmd-I. 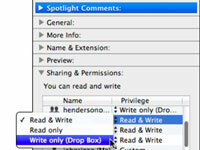 Alternatively, you can right-click or Control-click the folder to bring up a contextual menu, where you select Get Info. The Get Info window appears. If you don’t see a list of users and permissions, click the arrow next to Sharing & Permissions to expand the section of the Get Info box. 2To add a user, click the Add (+) button; to change the permissions of an existing user, skip to the last step. Users & Groups: These are local user and group accounts. If you don’t have a network directory, all your users are here. However, this category also displays some system accounts, which you should not alter unless you really know what you’re doing. 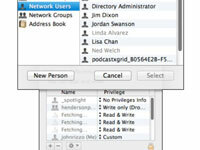 Network Users and Network Groups: These are user and group accounts in a network directory, such as Open Directory. Address Book: These are users listed in Address Book Server. 3Click a category of users on the left, select a name (or multiple names by cmd-clicking), and then click the Select button. The users and/or groups you now appear in the list. 4To change the permissions of a user or group, click the double arrows next to the name and select an item from the pop-up menu. The changes you make here show up in the Server app’s File Sharing pane. You may see some strange-looking user or group names, such as wheel. These are system accounts. Do not make any changes to these accounts unless you know what you’re doing. Don’t touch, or you risk breaking something.